When a developer is bought up by a large publisher there are obvious bonuses to be had, be it bigger budgets or better tech. 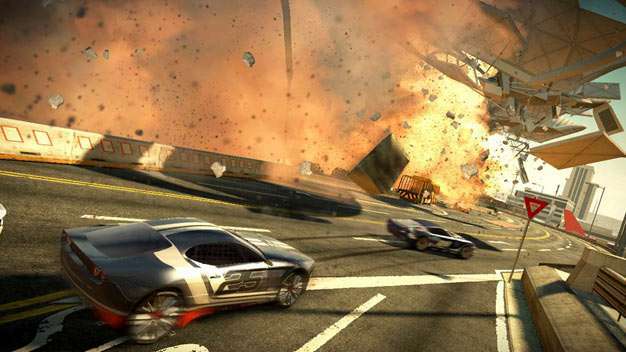 Black Rock Studio have taken advantage of a rather unique opportunity for their upcoming action racer, Split/Second, published by Disney Interactive. The team spoke to the people who thought up the rollercoasters for the many Disney Land parks across the world according to game director Nick Baynes. An odd move, you may say at first, but when you think about it, if anyone’s going to be able to think up an exciting, heart-pounding race track, it’s them. The guys obviously gave some great advice, as not one person was able to take their eyes off of the screen during a live demo of the docks track in a developer session at Eurogamer Expo last week. The first lap is exciting enough as explosions trigger left right and centre, and cranes take out the opposition effortlessly as they scrape along the ground. That’s nothing compared to the final two rounds of the track however, whole ships topple over, and constructions come tumbling down to make way for new routes. If rollercoaster designers can help bring this level of destructive joy to a racer, we can only hope more devs seek their words of wisdom in the future.